Piper Kenneth Mckay at the Battle of Waterloo, 1815. 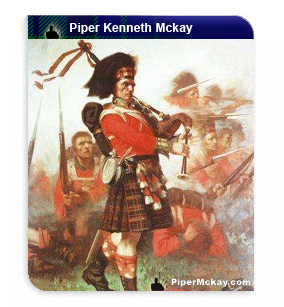 A heroic piper of the British army was Piper Kenneth Mckay of the old 79th (Cameron) Highlanders. This regiment was hard pressed like the rest of Wellington's army during the long hours of battle on June 18th, 1815 at Mont St. Jean near the village of Waterloo. During the course of the afternoon the French subjected the British to a number of massive cavalry charges in hopes of breaking Wellington's centre. The 79th Highlanders were forced to form squares, an all around defensive formation that infantry assumed against cavalry during this period. While the French cavalry dashed themselves vainly upon the British squares, the French horse artillery moved in close to fire murderously upon the exposed British troops. The situation was desperate as entire files were blown away by the French artillery. The 79th, like many other British battalions, were near the breaking point. The pipes and drummers of the battalion were kept in the centre of the square together with the colours and the regimental staff. During one of the lulls of the battle, Piper Mckay of the Grenadier company boldly marched in a deliberate fashion around the outside of the 79ths square playing the famous Piobaireachd "Cogadh no Sith" (Peace or War). Mckay's sangfroid under fire no doubt inspired his comrades, and the entire battalion. His devotion to the war like music of the pipes, played in these most appropriate circumstances, caught the public's imagination. King George III was so inspired by the event that he personally presented Mckay with a specially made set of silver mounted pipes that remain a treasured item in the regimental museum of the Queens Own Highlanders.